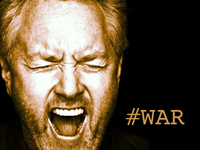 Andrew Breitbart is, and always will be irreplaceable. But he left behind a legacy that continues to inspire, and a road map for anybody willing to seek out the truth. In honor of Andrew, we are proud to present a brand new weekly feature entitled #WAR, where we will choose a video that reminds us all of the unique and powerful way in which he chose to fight for all that he believed, in an effort to level the playing field such that more voices could be heard. About 15 minutes later, Andrew showed up, handed me the latte, told me he had to go talk to someone I didn’t know about something I didn’t understand, and then he left. I took a sip of the latte, and then suddenly there was a young blogger in front of my table. He seemed confused, almost disoriented. I didn’t know him so I thought maybe that was just his “look,” but it wasn’t. He was trying to make sense of something, like his world had spun off its axis…and then he asked me: “Did Andrew Breitbart just bring you coffee?” It took me a second to understand why he was asking. I just said “Yes.” He shook his head and then kind of talked it out with me trying to get his arms around it: “I just can’t believe that Andrew Breitbart, with all his stature and importance would just bring you a cup of coffee like that. He’s like a hero and he brought you coffee?” Now, I’m pretty sure this was not a reflection on me but a rather the poignant reflection of one of Andrew’s many admirers realizing for the first time that Andrew was just a guy. Remarkable, yes. But just a guy, accessible to anyone who approached him because he saw the good in people. Because he liked people.